One of the best movie surprises I've ever had was the first time I viewed Shaolin Soccer. It was one of the movies Sam showed me and some friends during the golden age of his movie nights. He didn't tell us anything about the movie other than it was a Hong Kong kung fu movie about soccer. I was expecting something like what I had ignorantly considered a kung fu movie: bad acting, bad dubbing, cheesy sound effects and cleverly staged fight scenes. I had no idea I was going to see a very funny and self aware movie with Matrix style special effects. I was mesmerized. If you haven't seen it you are missing out. One of my favorite scenes in the movie takes place on a rooftop. The main character, played by Stephen Chow, has attempted to recruit his brothers to join a soccer team. He hopes they will use their individual kung fu skills and help him create a soccer team that can win an important annual tournament and bring awareness of kung fu to the masses. His brothers arrive on the roof in a slow motion procession accompanied by overly dramatic music. It's both stirring and hilarious. In that way it is similar to The Incredibles. The screen shot is of the oldest brother. 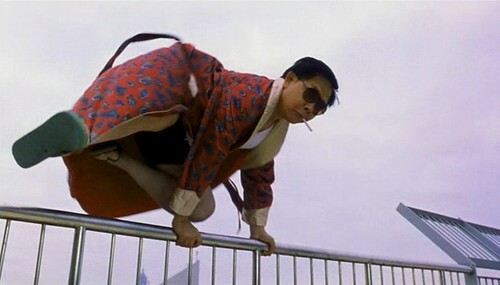 He arrives last and, instead of walking up the stairwell and through the opening that lets you on the roof, he leaps over the final barrier with his ever present cigarette. It kills me every time I watch him do it. If you ever do get a chance to see this movie I hope you can find the original Hong Kong release of it. The subtitles that come with that version are great. It is translated literally and has a charm of its own. It allows you to fill in the gaps. Kinda like William Shatner's acting.